Women, there is power in community. There is power in studying the Word of God and I want to just encourage and equip you and spur you on to love and good works as you grow in the grace and understanding of the Lord Jesus. This week we are studying in week one, In search of Joy, this idea of a longing for contentment. This is Heidi St. John! Welcome to the Heidi St. John podcast. Today is Wednesday December 5th. I’m so excited to be in the month of December. We have a lot to celebrate – not the least of which is the birth of the Lord Jesus. 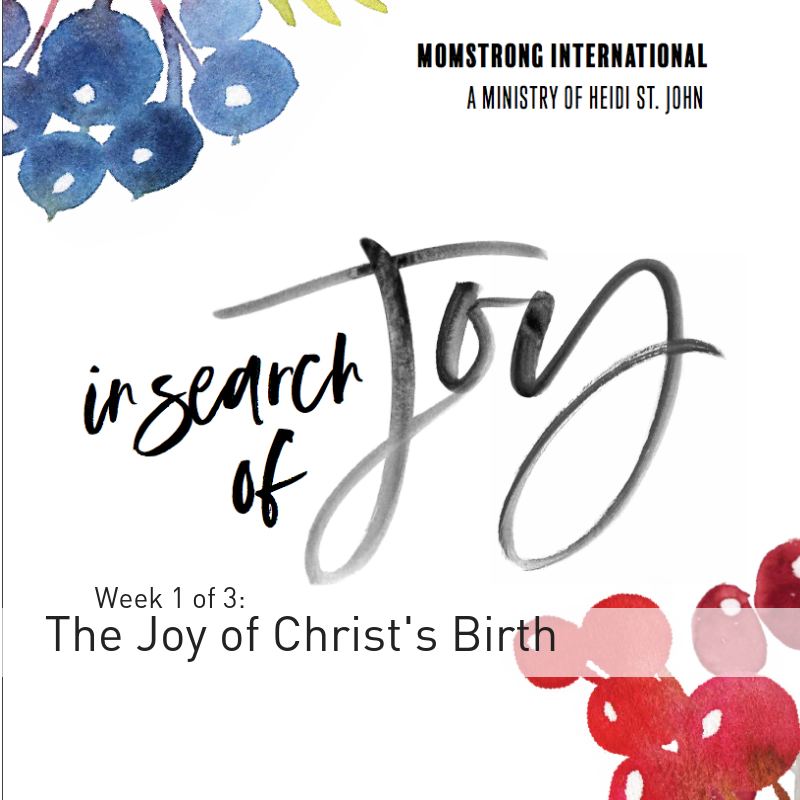 Today we are going to be talking a little bit about the MomStrong International Bible Study, In search of Joy. And, I’m going to answer a question from a listener. Stick around, I think you’re going to be encouraged. So you guys, today is the first Wednesday in the month of December. This is the first week of a brand new study at MomStrong International. If you haven’t become a subscriber there yet, can I just encourage you to do that? We are coming up on 10000 members of the Scripture Writing community – and as soon as we hit that we’re gonna start doing some really fun giveaways. We’re really close. We’re about 250 people off of that mark right now but we’re getting there. And I want to just encourage you we are studying God’s word together at MomStrong International. You can download that study and do it with your friends. You can become a leader at MomStrong International – just head over to MomStrong International and click on the application, and you can apply to host your own group. This week we are studying in week one, In search of Joy, this idea of a longing for contentment. The world has an undeniable longing for contentment. An unquenchable thirst for satisfaction – and listen you guys – contentment is never gonna be found in the aisles of a store, or in the fictional husbands that we read about who have unnaturally gracious responses to prayer to a perimenopausal meltdown, right? Those of you who have the husband says – I drew a bath for you. Go relax and I’ll have to handle dinner and bedtime. Not that that doesn’t happen occasionally in our homes. But you know what happens is we look at someone else’s husband who did that and we become covetous. Why? Because we are always longing for contentment. And satisfaction and contentment doesn’t come outside of the Lord Jesus because what we actually have is a hunger for joy. And Jesus is the only true source of it. I’m going to take this in a little bit of a different direction for just a moment because I received a question the other day – actually it was a scathing email – from a woman who was angry with me because I took a stand against what the culture is doing in promoting transgenderism. And I posted a video, and I’m thinking I might put this on my blog too – I haven’t done it yet – but I’m thinking about it! And I said – years from now after we’ve allowed our children to mutilate their bodies in the name of tolerance, and the lawsuits don’t heal the scars left behind by surgery, and puberty blockers, and hormones – I hope we remember this point in our collective story. We are searching for contentment. We are searching for satisfaction. We are searching for anything that will fill that void in our heart, that was meant to be filled by God. And what we’re doing, particularly in promoting transgenderism to our children, is wrong it’s wrong. DNA doesn’t lie, Your DNA doesn’t lie. So why-why would we allow this to happen? Because we care more about tolerance than we care about truth. Because we would rather exploit these kids than do the hard work of helping them have a healthy view of their bodies and their minds. Oh, you’re struggling with your identity? Here’s some puberty blockers for you. Have some hormones. Here’s a free surgery that the taxpayers would love to offer you. You guys, this isn’t love. If we love people struggling with gender dysphoria we would stop pushing this politically motivated ideology and get back to helping kids love the bodies they were born with. Love Never Fails. And we’re failing these kids. We’re failing them with their silence, we’re failing them with our unwillingness to stand in the gap for them – and sometimes love means telling a hard truth. Sometimes it means being willing to hear stories of hurt and abuse and help these young ones love the bodies that God created them to have, and that they were born with. So no – this isn’t love =. It’s anything but love. And this woman in her scathing reprimand of me said – you know Heidi, basically I don’t like you. Blah blah blah blah. She said – there’s nothing tragic about this. Stop telling people it’s tragic There’s nothing sad or pitiful This isn’t about DNA or self-esteem. This is about people being born into the wrong bodies about people who need acceptance and love while going through their transition and about your and others intolerance. Madison, thank you for writing. This is about love. It’s about a lack of love. People are not born in the wrong body. They may have a mental illness but we don’t treat a mental illness by cutting off a body part and sewing something else on in its place. This is tragic. So unlike my page, unfollow me, but mark my words – years from now this is going to backfire and I really hope that people will start loving these kids enough, to tell the truth. Loving them enough, to tell the truth. Another woman wanted to say – God would want you to stop trying to tell others how to live and stop judging them. Let people live the life they want to. So, Caitlin, this is my answer to you. Is this your attitude toward anorexics? Just let them live the life they want to? Is this your attitude toward heroin addicts? Let them live the life they want to? Is this your attitude toward a teenage alcoholic? Let them live the life they want? To let live and stop judging? Because if that’s your attitude toward an anorexic – just let them starve themselves because they think they’re fat – how is it loving someone to let them live the way they want to when they’re obviously hurting themselves? And that’s what I mean. This isn’t about love. We don’t love these people – because love would say: hey! this is going to hurt you. This is going to hurt you. Let me help you. This is not about shaming, by the way. This is about love and it is not about shaming. It’s about coming alongside someone and saying – you know what? I see that you’re hurting. Let me help you. God loves you. So often these kids do not know how loved they are. I saw a kid being paraded out on Good Morning America a couple of weeks ago. A young boy who his parents have dressed him like a girl, and put lipstick, and a wig on him – and I just think all of Heaven is weeping. Recently I heard from a young man who works at a very well-known grocery chain and one of his co-workers is transitioning to into a woman. And my heart just broke reading this letter from this employee. Because his employer has barred him from even telling this young man – listen you’re making a terrible mistake. So here’s this is what’s happening, let’s understand the surgery, let’s understand what this is because it’s not love. It’s a search for contentment and a search for satisfaction. And you’re never going to find it the end of a scalpel! And years from now when this young man’s body doesn’t work like it’s intended to work – what are we going to say then? My heart is breaking for this generation. And men and women, I just want to encourage you to get off the bench. If you have an opportunity to speak truth to somebody – speak it! Because where tolerance is the reigning virtue in a society – every other virtue must yield. Love must yield Truth must yield. We yield everything to tolerance and the enemy is having a field day with it. And I just want to encourage you. We are living in a culture that is desperately in search of joy, desperate for a search of contentment. We were searching for hope and change, right? So much so that we elected a president for eight years in a row thinking that’s gonna give it to us. I want you to think about that with me for just a minute. You have a message of joy, and hope, that is for all the people. Don’t be afraid. This is a beautiful time of year to read this story to your children – but also mom and dad, read it with your circumstances in mind right now. Don’t be afraid, the angel of Lord said: I bring you good news that will cause great joy for all the people. Today, in the town of David, a Savior has been born to you. He is the Messiah. He is the Lord. And while he walked the earth the creator of the universe, Jesus Christ, made no secret of the fact that He had made it possible for his joy to be in us. And for his joy to be made for. Do you remember at MomStrong International, our study of John – when Jesus praised the father in chapter 17. If you don’t remember, look back at your Scripture Writing from October 10th. He said – I am leaving these precious ones here and I’m coming back to you. I’m speaking as much truth as possible while I’m here. Father so that all these people could have my joy made full in themselves. Don’t take them out of the world but protect them from the evil one. Fill me up. Lord, I want some of that joy. I want some of that joy. If you’re looking for joy today, if you wonder where contentment is found – it’s found in Jesus. Fix your eyes on Jesus, the author and the finisher of our faith. Fix your eyes on Jesus. It’s so easy to grab our kids and want to shelter them from the pain in this world, isn’t it? It’s so easy to want to shelter them. It’s so easy to say – Hey! we’re not going to talk about that hard thing, or we’re gonna go over here and pretend like this stuff isn’t happening. But you guys when we do this we rob our kids of the opportunity for God to work in their circumstances, and to grow their understanding of His greatness, and to train their hands for battle. Remember that as we walk through these things that are so difficult. God is still at work. He is still at work. His word says that He is doing a good thing. The Bible says that Jesus endured the agony of the cross. He who knew not one second of sin – endured the shame of my sin and of yours. He endured the hostility of sinners. Sometimes I think, as we take a stand for righteousness in the culture – and I’m telling you – I’m here as living proof! The minute you take a stand people are gonna start shooting at you. I’ve started to consider it all joy. To consider it all joy. When people are hostile toward you – don’t grow weary, don’t lose heart – instead, ask the Lord to give you love and courage to speak the truth. This is a wonderful time of year to turn the eyes of the people around you toward heaven – that Jesus came into this dark world so that we could be made right with Him. What kind of love is that? What kind of example did He set for us? So this week you guys, keep your eyes fixed on Jesus. He went through all of those things, and more, to receive the joy set before him in God’s presence. Just as Jesus taught us by example, we teach our children when we set our gaze on God – and the result of that is inexpressible joy. Joy is not a product of your circumstances. It is the undeniable sign of the presence of God. It’s the knowledge that when everything around you seems wrong – you are right with God. You are right with God. 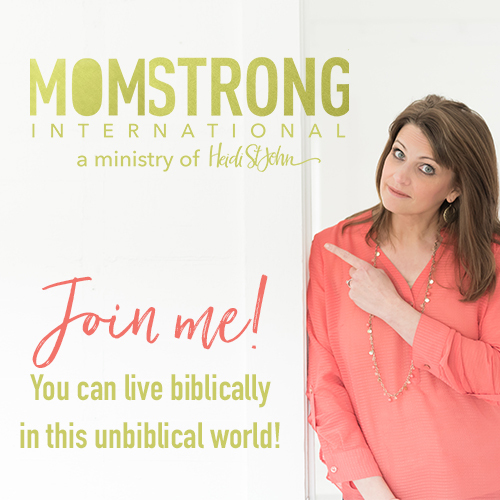 This week in the MomStrong International Bible Study we’re going to be asking you to write out first Peter 1:3-9, and as you do it – ask the Lord, ask the Holy Spirit to settle this passage deep into your heart. Because over the next several weeks we’re going to be talking more about it and we want the Lord to open our eyes to see the rich truths that lie in this passage. So ask the Lord to help you. Write out a list of the of the trials that you’re facing, things that are distressing you, things that are distressing you in the culture, things that are frustrating you in your home, or maybe you’re perplexed in your in your relationships. Pray over the list. Surrender each one of these things to the care of the Lord. Ask the Holy Spirit for help in keeping your eyes fixed on Jesus. God wants to give, to fill you with joy, and we want our kids to do that. Hi Moms, Merry Christmas! The Christmas season and all its festivities (and the chaos) is filled with many rich opportunities for shepherding your children. It’s easy to get caught up in the crazy, and while that’s okay, and pretty much unavoidable – I encourage you – don’t miss out. Ask the Lord to help you use each moment as a teaching tool to point your kids to Christ. Direct your children’s wonder to the season. Direct your children’s wonder of the season to their savior Jesus. Get involved in your church together. Donate your time and gifts to the needy. Teach your children that joy doesn’t come from gifts. That it’s not found under the tree. 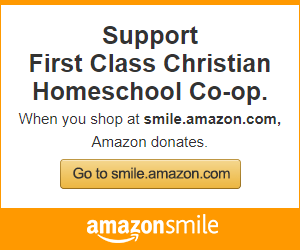 It’s not found at Walmart, on Amazon.com – but rather in the gift of Jesus in their hearts. How ironic is it that in a season where we celebrate the greatest gift we’ve ever received – a gift that took our good works and showed us that they never could have earned the relationship with God that Jesus purchased for us. And in the middle of the season, we are distracting ourselves and our children with superfluous gifts from a man who requires that they must earn through good works. I’m not saying no to Santa, but rather more of Jesus. His gift to us doesn’t require anything but our accepting it. How humbling is that? And maybe, just maybe, we can find greater and deeper joy this season, as we focus more on the source of that joy. For those of you who are frustrated and struggling with things in your life right now, or things that are happening in the culture – or maybe like me – you look around and every once in a while you have to kind of rub your eyes and say – are we really living in such a time as this? And the answer is yes. We are. But greater is He who is in us, than he who is in the world. God has good things for you, and you have – those of you who know the Lord Jesus – you have inside of you the hope and change that nothing else can offer. You have Jesus. You have Jesus! And I just want to encourage you — instead of normalizing what God says — speak the truth in love. Speak the Truth and Love. 3 We are human, but we don’t wage war as humans do. 4 We use God’s mighty weapons, not worldly weapons, to knock down the strongholds of human reasoning and to destroy false arguments. 5 We destroy every proud obstacle that keeps people from knowing God. We capture their rebellious thoughts and teach them to obey Christ. We don’t wage war like the world does. The weapons of our warfare don’t look like the weapons that the world uses. Get on your knees, men and women, ask the Lord to direct your heart and your mind back to His word., to speak the truth and love, to put feet to your faith, to get off the bench and onto the battlefield – knowing that one day the Lord Jesus who we celebrate this year, this season, is going to come back and He’s going to set things right. He is. And that’s where our faith and our hope rests. I’m going to go ahead and end this podcast in a word a prayer. Heavenly Father, oh Lord. Sometimes we struggle, we often struggle, to find contentment to find joy. We’re often wrestling father with things that we don’t understand and can’t reason away. And so Lord, would you help us right now – focus our hearts on You. Focus the hearts of our children on You. I pray that our families would be strong in you Lord. And that we would be strong in the power of Your word. God, I pray that you would give us your eyes, and your heart, and your passion, and your love for those who need it so desperately. Lord, I pray that we would find our strength and our contentment in You. That you would turn our eyes evermore toward You. That we would look for your coming soon. Maranatha , come Lord Jesus. And while we wait for your return Father, I pray that our lives might be pleasing to You. I pray Father that you would help us to speak of the joy of Your son Jesus to the whole world, knowing that the whole world needs Jesus. Thank You, Lord, for this time of year. Thank You Holy Spirit. Fills us up. Send us out. In Jesus’ name, Amen. I want to thank you guys for listening to the podcast. If it’s encouraging to you, it encourages us. If you leave reviews for this podcast over it iTunes – you can do that by clicking on a little gear shift, and then clicking on the little star – you can write a review and rate this podcast. Also, we really appreciate your financial support. This podcast does not have ads for a reason. We want to use every bit of this 20 minutes to encourage you back toward the Lord. If you would like to support the work that we are doing here we’d be greatly blessed by that. You can send us your gifts and any communication that you would like to Firmly Planted Family 11100 NE 34th Circle Vancouver, Washington 98682. Thanks for listening everybody, have a great Wednesday – and I’ll see you back here at my friend Susie on Friday.